Analysis finds Floridians with felony convictions would cast nearly 60K ballots in this election, D.C.mayor visits local jail to help eligible individuals vote, and more in our latest Disenfranchisement News. Disenfranchisement News is a monthly electronic newsletter produced by The Sentencing Project. To receive the newsletter in your inbox, sign up here. After Gov. Scott took office in 2011, Florida became one of the toughest states in the country for people with felony convictions to regain their voting rights. So few people had their rights restored during Gov. Scott’s first term that many others stopped applying. 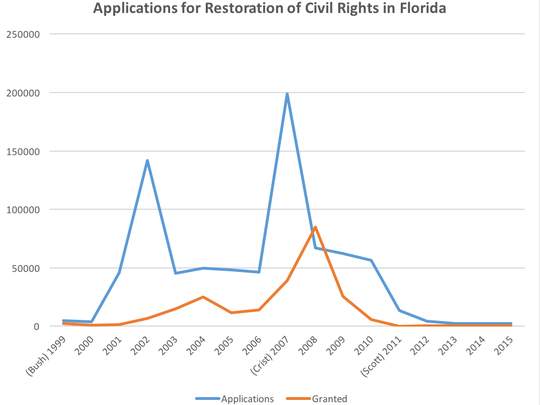 Applications for restoration of civil rights under Gov. Scott have dropped by nearly 95% from former Gov. Charlie Crist’s administration. The Florida Center for Investigative Reporting, in partnership with TIME, The Atlantic and the Miami Herald, released a video highlighting the story of Roderick Kemp, a Florida man who is barred from voting in this election because of a 30-year-old conviction for drug possession. Kemp spent just a few months in jail in 1986, and had been voting all his life. In 2015, he received a letter in the mail informing him that his voting rights had been revoked. Kemp is one of 10,000 Floridians applying for clemency this year. On average, Gov. Scott approves only about 400 cases annually. You can watch Roderick Kemp’s story here. A coalition of 17 organizations recently formed to advocate for legislation, and eventually a Constitutional amendment, to scale back the impact of felony disenfranchisement in Iowa. The Coalition for Fair Restoration of Voting Rights plans to focus first on restoring rights to those convicted of a nonviolent felony who have completed their sentence. Under the proposed legislation for next session, only Iowans convicted of murder, sexual abuse, robbery and kidnapping would lose their voting rights. Civil rights advocates say the current system for restoring voting rights, which Gov. Terry Branstad streamlined earlier this year, remains overly burdensome. “This is a situation where people have already served their time. Justice has been exacted, and people are continuing to suffer the collateral damage,” says Betty Andrews, president of the Iowa-Nebraska NAACP and member of the Coalition. Mayor Muriel Bowser and the D.C. Board of Elections went to the D.C. jail to help individuals awaiting trial and those serving misdemeanors cast absentee ballots for the upcoming presidential election. According to the D.C. Board of Elections, D.C. is one of only three jurisdictions that has established a process by which eligible individuals in jail are permitted to vote. Each person is given a voter registration card when they are first admitted. “We want to involve everybody in the franchise,” said Mayor Bowser. Individuals serving felony sentences at the D.C. jail are not allowed to vote until they complete their sentences. The Fortune Society, a reentry advocacy organization, and a group of New Yorkers on felony parole recently traveled to Ohio to inform Ohio residents with felony convictions of their right to vote. In New York, individuals with a felony conviction are barred from voting until they complete their parole supervision. However, Ohio (a battleground state in the presidential election) is one of 14 states that allow those with felony convictions to vote as soon as they are released from prison. Many people in Ohio on felony parole are unaware of their right to vote, which is why the New Yorkers took a road trip to Cleveland. “I can’t vote, so let me try to encourage at least five other people — family members and friends — by talking about political issues and how they affect us. And why you should vote,” one New York group member said. Marc Mauer, Executive Director of the Sentencing Project, was recently featured on C-SPAN discussing The Sentencing Project’s publication, 6 Million Lost Voters: State-Level Estimates of Felony Disenfranchisement, 2016. The report found that 6.1 million people — 1 of every 40 adults — are disenfranchised because of state laws that bar voting by Americans with a felony conviction, and in some states even if they have completed all requirements of their sentence. Over three-quarters of this population (4.7 million people) are not incarcerated, but are living in their local communities – some on probation or parole, while others have completed their legal obligations. The program discussed the various state laws and recent reforms. Mauer responded to telephone calls and electronic communications from people for and against restoring rights to people with felony convictions, including a telephone line reserved for people with felony convictions.